Rick McKinney of Eaton, Ohio, received a Jules and Gwen Knapp Ambassador Scholarship from Students in Free Enterprise (SIFE) USA. The national scholarship recognizes the leadership, teamwork and communication skills developed in SIFE students. McKinney is a junior business administration major with a minor in entrepreneurship at IU East. He has been a member of SIFE since fall 2010 and is an active participant in workshops provided through the Center for Entrepreneurship and the Center for Economic Education. 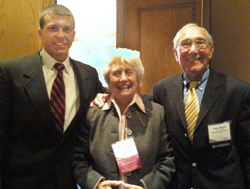 Jules and Gwen Knapp offer up to three scholarships through SIFE. McKinney received a $2,500 scholarship. The scholarships are based on academics, community involvement, and leadership of the applicants. To receive the scholarship, McKinney went through an application process that included a panel review between the top three finalists at the SIFE USA National Exposition held in Minneapolis, Minn., May 10-12. As a recipient, McKinney will be a Knapp SIFE Student Leader for one year and may be asked by SIFE to represent the organization on campuses and/or at events throughout the academic year. The SIFE team at IU East is advised by Tim Scales, lecturer in business administration and the director of the Center for Entrepreneurship. Scales traveled to Minneapolis with McKinney for the scholarship interview and presentation. “It’s an exciting time to be seated in a crowd of thousands and witness a student from Indiana University East being honored for their high achievements, academics and community service,” Scales said.